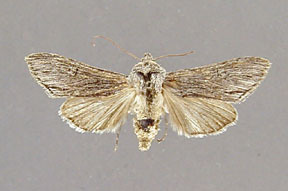 Copicucullia incresa Smith, 1910, Jour. New York Ent. Soc., 18:97. Diagnosis: Cucullia incresa is one more of those perplexing problems that seem to pervade the genus Cucullia. 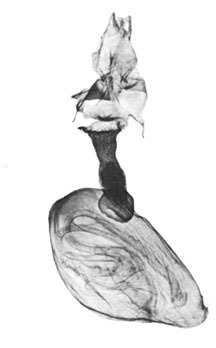 Neither the male or female genitalia are consistently different than those of antipoda, the ranges in variability in both species overlapping each other. 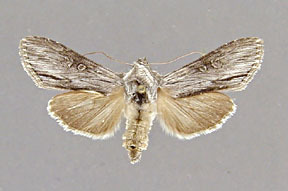 Cucullia incresa, however, has two distinguishing superficial characteristics; 1) the male hindwing is either pure white or white with light brown accenting on the veins (depending on the population involved), and 2) the frontal ridge of the head is usually developed into a large, roughly triangular protuberance that is normally much more pronounced than in antipoda. The melanization of the abdominal sclerites in females is greater than in antipoda. This melanization is reflected, in particular, in a sclerotization of the seventh sternite into two bars that are not present in antipoda. Wing length from base to apex: mean = 17.51 mm., standard deviation = 0.82 mm., n = 10. 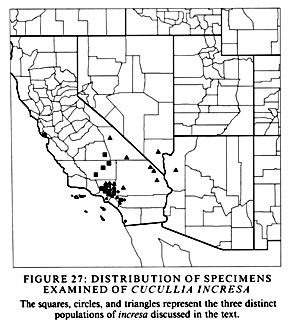 Distribution: Cucullia incresa is divided into three geographical races with relatively sharp boundaries, although many integrades exist. One race occurs in the coastal and west-central mountains of California as far north as Santa Cruz and as far south as San Diego. If a subspecific concept is used, the nominal subspecies will refer to this race. 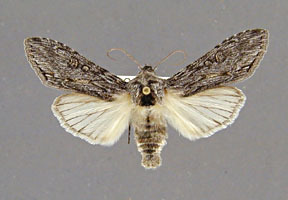 These populations have a smooth gray to dark gray appearance and the area of the forewing below the cell and toward the outer margin is usually strongly tinted with white. 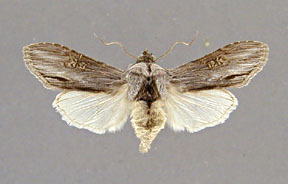 Specimens from the Los Angeles Basin are similar, but the white shading in the cell of the forewing is usually not nearly as pronounced. 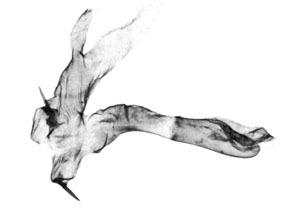 In both races the veins of the forewing are not distinctly accented and the wing does not appear striate. 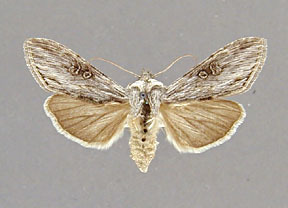 The male hindwing in these two races is whiter, on average, than is normal in specimens from the Mojave region, and some specimens, notably specimens from Loma Linda in San Bernardino County, have a pure white male hindwing without any brown accenting on the veins. The third race of incresa is apparently a denizen of the Mohave Desert, from the western edge of the San Bernardino and San Gabriel Mountains, running north to the Owens Valley and Death Valley regions of Inyo County and east through southern Nevada and northwestern Arizona. This race is characterized by a black coloration of the forewings and a striate appearance caused by dark, black accenting on the veins. The middle of the forewing may or may not be distinctly lighter than the costal or inner margins, but none of these contrasting specimens have the smooth, almost glossy, look of the coastal and central California populations. Although multiple integrades exist between the first two races, the line of demarcation between them and the Mohave populations is very sharp at the eastern edge of the San Gabriel Mountains. The Mohave population is conceivably a distinct species. Adults have been collected from the middle of March until the middle of July. 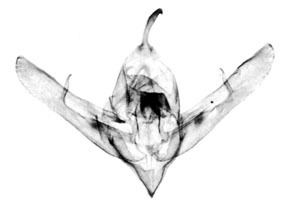 Most specimens were taken from April to early June.